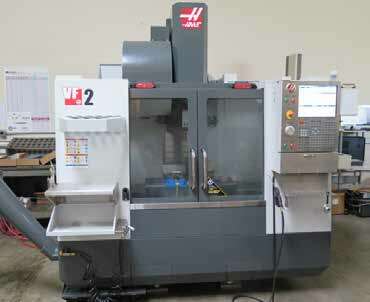 2015 Haas VF-2 CNC Vertical Machining Center s/n 1121274 w/ Haas Controls, 24-Station ATC, CAT-40 Taper Spindle, 10,000 RPM, Chip Auger, 16” x 36” Table, Coolant, 632 Power On Hours, 167 Cycle Start Hours. Acra Mill Vertical Mill w/ Sargon DRO, 3Hp Motor, 60-4200 Dial RPM, Chrome Ways, 4” Riser, Power Feed, 9” x 42” Table. Famot mdl. TUM-35D 14 ½” x 46” Lathe s/n 0645 w/ 28-2500 RPM, Inch/mm Threading, Tailstock, Trava-Dial, Aloris Tool Post, 5C Collet Closer, 8” 3-Jaw Chuck. Harig 612 6” x 12” Surface Grinder w/ Newall Sapphire DRO, 6” x 12” Magnetic Chuck. DoAll mdl. 16-SFP 16” Vertical Band Saw s/n 79581921 w/ 24” x 24” Miter Table. Esab Migmaster 203 MIG Welding Power Source s/n 402-807-11570. C & M Topline Media Tumbler. 1997 Kaeser AS31 25Hp Rotary Air Compressor s/n 3111818 w/ 115 CFM @ 110 PSIG. Deltech mdl. HGE125 Refrigerated Air Dryer. Raymond Stand-In Electric Pallet Mover w/ Extendable Forks, Charger. Mitutoyo mdl. BH506 CMM Machine s/n 96070002 w/Renishaw MIP Probe Head, X=19.68”, Y=23.62”, Z=15.74”, Granite Surface Plate, Stand, Kaeser KRD010 Refrigerated Air Dryer, Computer. Mitutoyo mdl. TM Tool Makers Microscope w/ Digital Micrometer Heads, Light Source. Zeiss Surfcom-130A Digital Surface Roughness Gage. Starrett Crystal Pink 24” x 36” x 6” Grade “A” Granite Surface Plate w/ Stand. Starrett 20”-24”, 16”-20” OD Mics. Vermont .061”-.750” Pin Gage Cabinet. Mitutoyo 2”-4”, 1.4”-2.4”, .7”-1.4” Dial Bore Gages. (3) Kurt 6” Angle-Lock Vises. (5) H & H 3” Angle-Lock Vises. Suburban “Micro Grind” MG-5CV-S1 Precision Grinding Fixture. Herman Schmidt Precision Grinding Fixture. Suburban 6” x 6” Compound Magnetic Sine Chuck. Bridgeport Quill Master Milling Head.